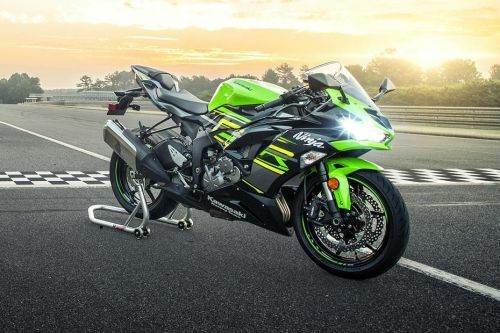 The 2019 Kawasaki Ninja ZX-6R was launched in Malaysia at the 2018 Kuala Lumpur International Motor Show (KLIMS). Kawasaki has made the new ZX-6R much more attractive and desirable by making some changes. The new bike shows off its LED twin headlamps inspired by the mighty H2 whereas the tail light is similar to that on the ZX-10R. Also, new is the instrument cluster that features an analogue tachometer along with an LCD screen. Powering the new Ninja ZX-6R is a 636cc inline 4-cylinder engine that produces 128 horses and great low-end torque. Combine the power with 3-mode KTRC (Kawasaki Traction Control), KIBS (Kawasaki Intelligent anti-lock Brake System) Valves, and assist and slipper clutch and you’ve got yourself one capable sportbike. Have a question on Ninja ZX-6R? Ninja ZX-6R is available in 2 different colors - Metallic Grey and Metallic Spark Black. Watch latest video reviews of Kawasaki Ninja ZX-6R to know about its performance, mileage, styling and more. Unlike what many would think, Moto GP is no less technical than Formula One. Example one: The new Kawasaki Ninja ZX-6R. While we say new, what we mean is the updated Kawasaki Ninja ZX-6R. Bristling with race-developed technologies like traction control and switchable power mappings it gives normal riders a taste of that sweet-sweet performance. This model of the Ninja 6R made it onto the scene in 2013 and since then Kawasaki has kept it fresh with constant updates and improvements. It had a race bike like performance when it was first launched and still does today. While it may seem to be in the same league as the Honda CB650F, it is miles ahead in terms of power and performance. As expected the Kawasaki Ninja ZX-6R’s price is also in a different league at RM 70,000. But as you will find out this bike is very much worthy of its price tag. The styling of the Ninja ZX-6R is not as aggressive as you’d expect from a Kawasaki. There are clean panels on the sides. The front gets a twin headlight setup with a large double bubble windshield and a ram air intake between them. The exhaust is a slim short style with triangular section end. The sculpted tank is ergonomic but the seat looks uncomfortable. The same can also be said for the pillion seat. The bike truly takes an aggressive and aerodynamic shape when the rider gets on tip of it. This Kawasaki is very compact with its 2085 mm length, 1395 mm wheelbase, 705 mm width, and 1115 mm height. The ground clearance of 130 mm is decent. The Ninja ZX-6R rides on fat 120/ 70 tire on the front and 180/55 tire on the rear both wrapped around 17-inch wheels. Instrumentation uses a large analogue dial tachometer and LCD screen combination. It comes with an economical riding indicator and a large numerical gear position indicator to avoid mis shifts. The seat is high at 830 mm and provides for an aggressive posture. But the rider triangle is surprisingly comfortable, as weight is not resting on their wrists. The feet are also comfortably placed. The bike’s 194 kg mass is centralized low, making it very flickable. The aluminium perimeter frame is good for the job. It delivers excellent feedback and stability. The seat is easy to move about in but not the best for normal riding – which is kind of expected. The mirrors do not vibrate and are actually usable. The Kawasaki Ninja ZX-6R uses two of Showa’s advanced suspension technologies – separate function fork and big piston fork. These big piston inverted 41 mm front forks are fully adjustable with adjustment screws on the top of the forks for easy access. Preload adjustments can be made on the left side while compression and rebound damping on the right. The rear gets a fully adjustable Uni-Trak gas charged shock that can also change the ride height. The Kawasaki Ninja ZX-6R specifications make it a veritable race bike straight off the track. Kawasaki has given the ZX-6R, a gem of an engine in the form of a 636 cc long stroke liquid-cooled 16 valve in-line 4 DOHC unit. It gets a square-shaped RAM air intake up front that creates extra pressure for the fuel air mixture. Revised low friction pistons are stronger and allow increased valve lift. The fuel injection uses 38 mm oval Keihin sub throttles. All this means that the NX-R6 produces 135 hp at a stratospheric 13500 rpm and 71 Nm of torque at 11500 rpm. Kawasaki has increased the performance across the rev range. Majority of the torque is available in low and mid-range that gives it real-world usability. Power delivery is strong below 6000 rpm but after that, it really comes into its own like a race bike. Thankfully the bike comes with two power modes – Full Power and Low Power. The Low Power mode delivers only 80% of Full Power while also giving a milder throttle response. The output at lower RPMs is same for both power modes. The Ninja ZX-6R also uses a race-derived assist and slipper clutch. The assist clutch allows a lighter and sportier feel at the lever while the slipper clutch uses a race style back torque limiting function that prevents wheel hopping during quick downshifts. Then there is the 6-speed cassette type transmission itself that comes with a short first gear for quick acceleration. Being cassette type it is also easily removable for quick changes. The braking is at par with race bike spec with dual semi-floating 310 mm Nissin petal discs, 4 piston Monobloc calipers in the front and a single 220 mm petal disc with a single aluminium piston in the rear. But wait there’s more. The bike also gets advanced electronics in the form of 3-Mode Kawasaki Traction Control and Kawasaki Intelligent anti-lock Brake System. Both of these give it superior braking confidence and precision handling on all kinds of road surfaces. At a price of under RM 70,000, this Kawasaki Ninja ZX-6R is closest to a race bike you can get on the road. Looking at it from that perspective, it is very much of a bargain. It is by birth a crotch rocket for the track. I am very satisfied with it. What are the Safety Features Available in Kawasaki Ninja ZX-6R? Is Kawasaki Ninja ZX-6R available in Electric?